Captain Picard stands at a podium in the middle of a large sunlit grassy meadow. He's addressing a gathering of the crew, seated in fold-out lawn chairs. There are empty seats. Jean-Luc is introducing the official eulogy for the missing crewmembers. His hand has been forced, as despite searching all hours for days, the Enterprise can find no trace of the vanished shuttlecraft Albert Einstein, and Starfleet can't justify postponing its mission indefinitely to look for it. Such services are intended to serve as a formality to remember the departed and to help the survivors work through and accept their guilt. But the Enterprise crew doesn't need that. Beverly Crusher, whom we might expect to be the most affected by this, puts it succinctly: “If he's dead, he died helping others. Isn't that the best way?”. And if it hadn't been Wesley, than it would have been someone else, and Jean-Luc still would have had to deliver the awful news. And yet even so, she still sheds a tear. Deanna Troi, ever refined and composed, has a feeling the crew's comrades are still alive, and she can sense that Jean-Luc does too. But she concurs that there's no basis to continue a formal search, so she goes ahead with the preparations. Condolences are broadcast across known space. Kyle Riker laments losing his son so soon after reconnecting with him. After her new captain breaks her the news, Doctor Katherine Pulaski returns to her patients, but says she's going to need a lot of time to herself afterward. Selar's parents cope in their own way. And on Betazed, Lwaxana Troi is absolutely devastated. Even though her own daughter was not on the shuttle, she feels the loss as strongly as if it were that of her own children. The Enterprise has left its mark on her. Captain Picard, Deanna Troi and Geordi La Forge deliver the eulogies. 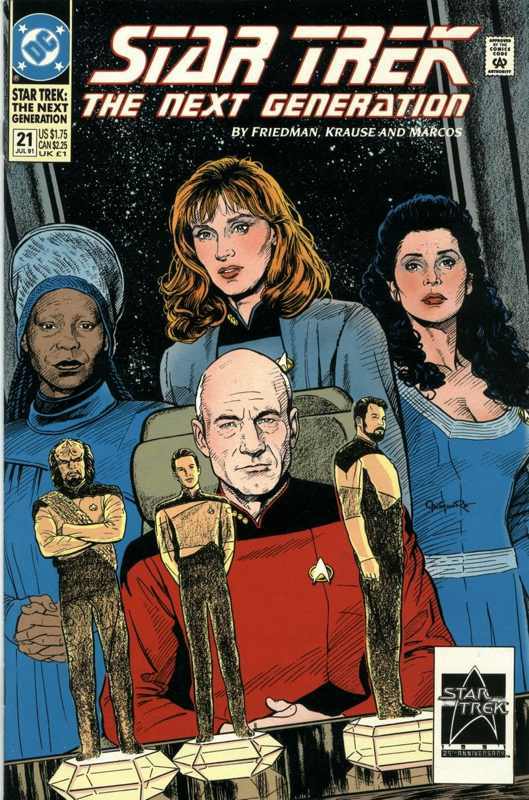 Jean-Luc for Will Riker, Deanna for Worf and Geordi for Wesley Crusher. This is at once entirely unexpected for one more familiar with the TV series, or at least the received historical reading of the TV series, yet it also feels eminently natural and right. Deanna speaks of Worf's pride in his ship and the his family aboard it, a pride that turned into a very powerful love. Geordi shares a memory of Wesley, and he retells it in the manner of one recalling an especially vivid dream. Jean-Luc Picard's speech to his crew begins to reflect the conflicted feelings of his inner monologue he shares only with the audience, slowly becoming one. He wonders how much he really knew the people they have gathered to remember, especially Will, even though he sat next to him every day. He fears he was always too busy for them and that he never got the chance to tell them how proud he was of them and how much he liked them. Now the crew is gone, and Captain Picard is left alone. He calls up holographic images of Will, Worf and Wesley and tries to tell them what he was never able to tell them before. He muses on the irony of them standing before him in this manner in the same way Tasha Yar did to all of them. But he can't say what he needs to say, because he can't accept that any of them are truly dead. And yet there's utopianism even here, even apart from the way the crew handles grief with such impeccable grace and dignity: Captain Picard's steadfastness would feel like denial if we didn't know he was right. We know the crew of the Albert Einstein are still alive and the comic line can't kill off major characters permanently. We know this story gets a happy ending-It's what happens in between where we can learn things. It is, of course, the same holographic meadow from “Skin of Evil”. But it's this story I associate it with, not that one. That placid green and sunlit field gently rolling off into eternity. The camera pans overhead, looking down on the somber Enterprise crew gathered around a podium as birds and squirrels mull about in the trees above them. The meadow's sun-kissed warmth contrasting with the elegiac feeling permeating the entire land. Although truth be known, after I lost this story and I stopped watching Star Trek: The Next Generation the first time, I forgot what a holodeck was and that the Enterprise had one. I didn't think about it much, but I guess I figured that meadow was an actual place onboard the Enterprise, as if its hermetically sealed high-tech world just...faded away at some point on the ship and transitioned to some mystical Otherworld. Liminal spaces within liminal spaces. When I was younger I would often imagine Star Trek: The Next Generation stories of my own, and sometimes I'd send the crew on holodeck adventures too (though after I'd gotten to the point when I remembered what indeed the holodeck was). This was always the programme I would send them into. I couldn't tell you why I did that. 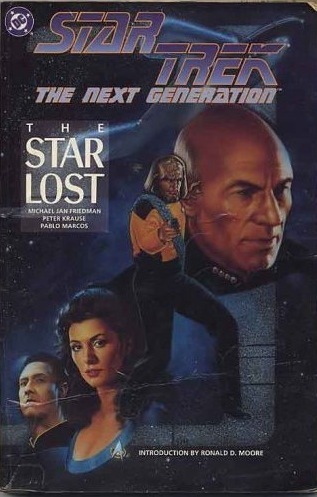 Echoes of “The Tholian Web” from the original series are audible to me as I read The Star Lost this time. Once again, we have the Enterprise crew forced to give their comrades up for dead, despite no-one being able to accept it. But anger and denial where the emotions that categorized that story. This time, it is grace and elegance. There are, of course, the obvious “Skin of Evil” parallels, but I don't even really consider “Skin of Evil” worthy of proper comparison. I'm also reminded of “The Bonding” in the way the story examines the process of loss and grieving, albeit in a far more visceral manner as these are our heroes and friends, not a one-off guest character. As Will Riker once said, we feel loss more keenly if it is of one close to us. It's not the first time Star Trek has handled this theme. It will be far from the last, even in Star Trek: The Next Generation. But this I think may be its most poignant and profound statement on the matter. I'm sure my own biases and predispositions are showing through here, but they can't help but show through when I'm made to write about this kind of story. That's the nature of the work I'm doing, that's part of who I am and part of what this job entails is trying to articulate that somehow. These characters have meant more to me over my life than any other, and writing this book, especially now, feels a bit like I too am going through the process of coming to terms with this and letting them go. I suppose in a sense it's deeply fitting that The Star Lost bookends both the beginning and the end of my association with Star Trek. On the Albert Einstein, Worf tries to console Nurse Faraday, who confesses to him that she feels regrets about the way she's lived her life. But Worf reminds her that her life is not over, and that “this is a time for courage, not despair”. When Faraday confides that she feels very scared and that such courage might come easier to someone like him, Worf shares with her a saying he learned from his adoptive parents: That courage is “the mastery of fear – not absence of fear”. Mark Twain, naturally, through a Klingon lens. And sure enough, Wesley picks up a space station with signs of life. Utterly unknown life, of course, but life nonetheless. Worf advises caution, but has the crew proceed with first contact anyway, a move that garners grumblings and side-eye from the junior officers. And naturally it's Selar who reminds them that Worf is both Klingon and a Starfleet officer, and that he makes decisions from both sides of himself. What the crew of the Albert Einstein find, however, is jumbled, twisted mass of mismatched starships tangled together in the depths of space. "but I guess I figured that meadow was an actual place onboard the Enterprise, as if its hermetically sealed high-tech world just...faded away at some point on the ship and transitioned to some mystical Otherworld. Liminal spaces within liminal spaces." That's a great image, there being an actual meadow on the Enterprise, would have loved that to be the case.